✨ Achieve a healthy and natural posture! We know you've had enough of that excruciating back pain due to those long hours at the office and we are here to help you finally solve this eternal problem! During the first week, use it for no more than 1 hour, and gradually increase usage by 10-20 minutes the following days. Step 1: Put the 3 Velcro straps through the round buckle's links and adjust the posture corrector to be loose at first for easier handling. Step 3: Grab the 2 long straps' endings, detach the Velcro and pull. Adjust until you feel it is pulling your shoulders backwards, and then reattach them. If necessary, do the same with the short strap (the one with the logo on it). ✔ CORRECT YOUR POSTURE - Looking to improve your back posture? Our corrector brace for men and women will definitely help you! It is designed specially to shift shoulders back, push your chest out and achieve a proper, natural and perfectly straight back alignment. 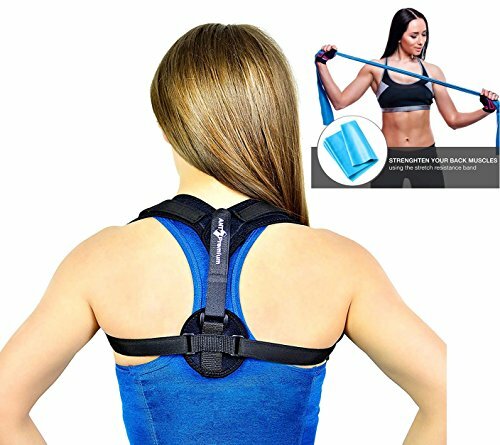 ✔ NO MORE BACK PAIN - ANT Premium Posture Corrector provides the upper back with support, thus your muscles will strengthen, develop a memory and after a period of time slouching will be completely eliminated. Feeling a slight discomfort at the beginning is only normal, your body needs time to adjust to the healthy spine and vertebrae position. ✔ COMFORTABLE & FULLY ADJUSTABLE - We used only the finest quality neoprene to make sure rough fabric edges do not irritate your skin or cause any discomfort. This premium medical aid is one size, unisex and fully adjustable using the 3 extra long velcro straps. Perfect for chest sizes between 28" and 48". If you have any questions about this product by Ant Premium, contact us by completing and submitting the form below. If you are looking for a specif part number, please include it with your message.